OMW I was not aware. This just made my week!! It's a Silver ETN, I want to ad 2 ETN's in my portfolio just for the sake of diversification. What is this! I am in love. 26% over 4 years, avg of 6% per year....... no thanks. I like it since it's stable. 15% of my portfolio in this sounds so good? The Ashburton Top 40 ETF looks attractive? The old RMBT40? What's so attractive about a vanilla top 40? And? You're not really comparing apples with apples here. ASHT40 (RMBT40), STX40 and STAN40 are all just regular market cap top 40s (the oldest ETFs in South Africa). SWIX, RAFI and EW are all completely different from the above three (which all suffer from that inherent flaw that a single share can have too high a weighting). It's not. Maybe between the two dates you chose but SWIX outperforms it. Interesting to see how the JSE will do today, personally if I was to guess I would guess green, how do I get to that? Easy, I want it to be green so I guess for the best. SOME green finally appeared in stock exchanges trading ahead of the JSE’s opening on Wednesday morning, halting five red trading days which have seen the JSE’s all share index lose more than 5% over the past week. Even though mainland Chinese stocks failed to make the inclusion of MSCI’s World Index which is tracked by many exchange-traded funds, the Shanghai Composite Index jumped 1.5%, and the Shenzhen Composite Index nearly 3% on Wednesday morning. I am definitively out of step with just about every observer of the passing economic scene. For I think that today is when the Federal Reserve should indeed announce a rise in the interest rate. The markets in general are predicting that this has a 1% or so chance of happening. And we’re even told by some that the Captain Obvious point is that there won’t be such a rate rise. So, there’s obviously a high likelihood that I am wrong here – but that’s OK. As long as I explain my reasoning then we can at least work out why I am wrong, if indeed I am so. I don’t think that rates should rise to aid pensioners and those on fixed incomes. Nor because we imminently face runaway inflation. Rather, I think that rates have been kept lower than they otherwise would have been in pursuit of an experiment. Quite rightly too, as I consider that experiment to have been worthwhile. It’s just that that experiment is now done and we can see the result. Which is that we shouldn’t be carrying out that experiment any more. I’m in fact insisting that it is the slow job growth just reported which is why rates should rise now. Till when is the JSE closed? I see EasyEquities says -> the securities are unavailable for trading as the platform is currently closed. Please let this be a green day! 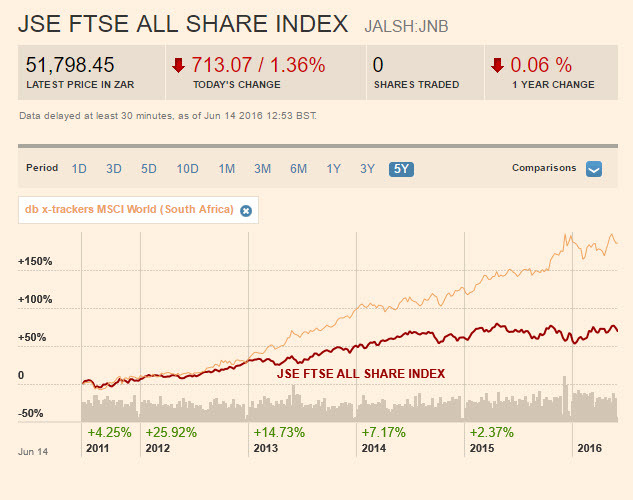 JSE overall is blood, but at least taste is 0.4% up. Only thing on my side in the red is NEP which is taking another beating. Down 1.25%. Fscking BREXIT "fears"